A slightly worn Nummus (Follis) of Constantine I. Measures 21.9mm diameter by 1.7mm thick and weighs 4.18g. Obverse description: Diademed, cuirassed bust right. Reverse description: Radiate Sol standing left, holding globe. Reverse inscription: SOLI INVICTO COMITI"T" and "[F]" in left and right fields. A slightly worn and corroded large denomination Nummus (Follis) of Constantine I. Measures 23.9mm diameter by 1.7mm thick and weighs 4.56g. A heavily worn and corroded Nummus (Follis) of Constantine I. Measures 19.4mm diameter by 1.8mm thick and weighs 2.74g. 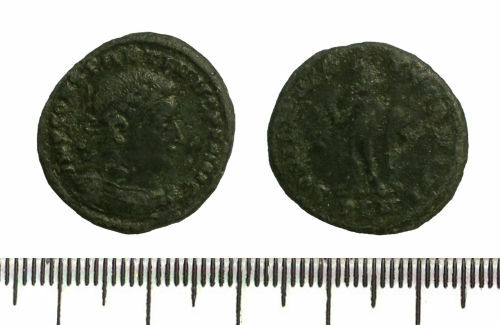 A slightly corroded copper-alloy Nummus (Follis or AE 3) of Constantine I. Measures 21mm in diameter, by 1.7mm thick and weighs 2.84g.